Mario Lee M.D. checks Tim Cline’s healing progress. Excellent care a straight-shooting doctor and a friendly staff all helped make Tim Cline of Union City a big fan of Reid Orthopedics. He found Dr. Lee after seeing a TV ad. He started asking around researched him online to check out his experience and finally made an appointment. 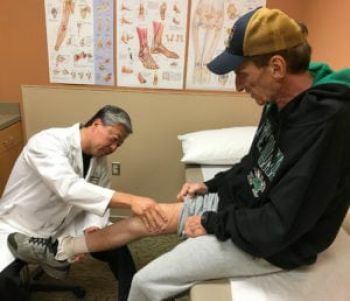 “I wanted to see where he went to school how long he’d been an orthopedic surgeon.” He and Dr. Lee worked together with less invasive treatments to deal with his pain for about six months. Cline says the pain was most likely linked to a football injury while he was in the Air Force and years of work that found him on his knees painting things like jets and yachts where he worked in Florida. A resident of Fort Lauderdale for about 40 years Cline returned to Union City so his sister could help him when he began having knee trouble. He says Dr. Lee told him he’d reach a point where he’d be ready for a knee replacement – and he did this summer and had the operation in August.